A New York design collective will have a permanent space inside Hudson Yards. Snarkitecture, a three-man art and architecture curation group, will have a roughly 6,000 s/f ticketed exhibit area on the second floor of 20 Hudson Yards, inside the building’s retail section. The venue, which will be known as Snark Park, will include “museum-quality” installations and art programming, according to a release from group. The space will open to the public on March 15, 2019. 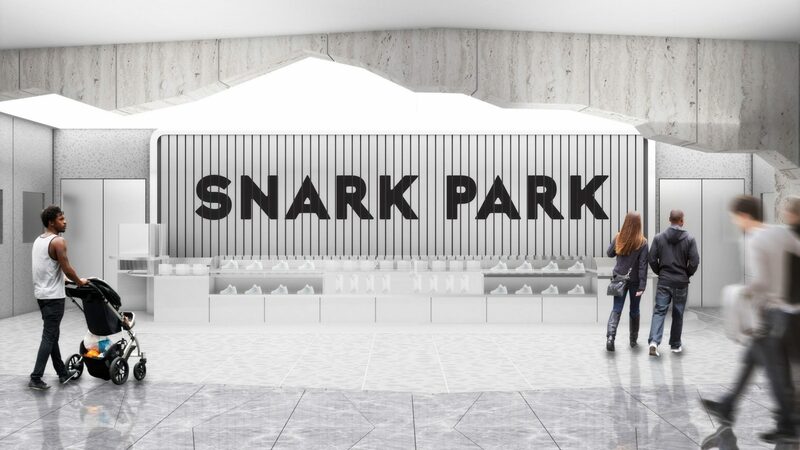 Snark Park is the latest commitment to arts and culture on display at Hudson Yards, a new mixed-use neighborhood being pioneered by the Related Companies and Oxford Properties Group on Manhattan’s Far West Side. The development, which is being constructed on top of a platform covering Midtown’s western rail yard, also includes The Shed, a performance art venue, and New York’s Staircase, a spiraling walkway structure designed by Thomas Heatherwick formerly known as The Vessel. With exhibits in South Korea, Italy, Miami and several locations throughout New York City, Snarkitecture specializes in collecting sculptures, such as contorted furniture and household items, as well as creating interactive experiences, some of which are large and immersive, such as The Beach, a traveling exhibit that mimics a sandy waterfront with recycled plastic materials. At Snark Park, the trio will roll out a tri-annual exhibition schedule that will consist of unique, playful design environments that incorporating unconventional materials and concepts of reduction. They will also feature the studio’s signature monochrome aesthetic. Once complete, Hudson Yards will include 4,000 high-end residences, a new 750-seat public school, a 200-room Equinox Hotel and more than five acres of public space. It will also feature several new office skyscrapers, including 55 Hudson Yards, with almost 1.3 million s/f, and The Spiral, with 2.85 million s/f.